WELLESLEY HILLS, Mass. – When the look says “castle,” but the construction says drywall, a thin-veneer stone can go a long way. At least that’s the experience of Ed Loughran, owner of the locally based Charles River Wine Cellars, Inc., who’s taken his stone expertise from landscapes to basements in recent years, with rewarding results for both him and his clients. Loughran got into his niche market by happenstance. 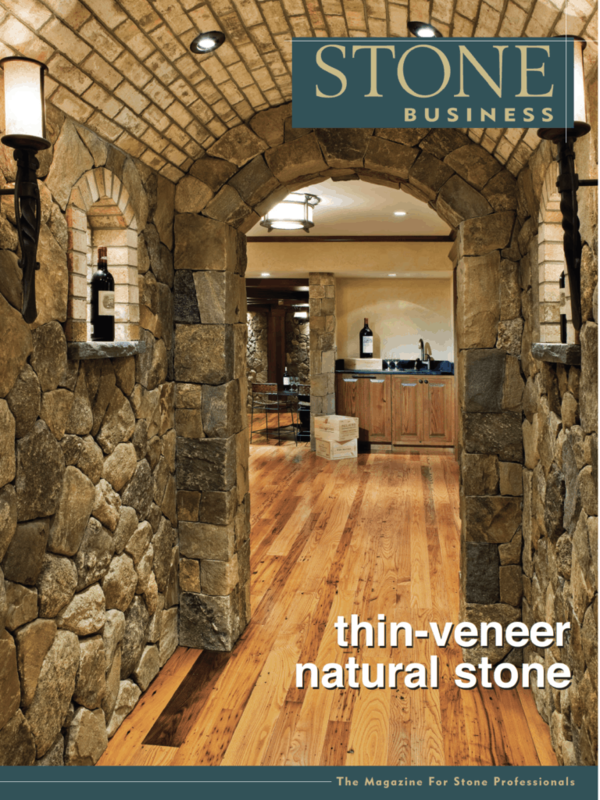 Before going into the wine cellar business, he operated a hardscape company that specialized in exterior sitting walls, patios and custom granite work. One landscape-project customer asked about using the exterior stone for a wine cellar in his soon-to-be-remodeled basement. Loughran says immediately the light-bulb went on. He also has some background in carpentry, and he could see it as a good way to fill the time between late November and early April, when New England weather precludes a lot of outdoor work. A good example of Loughran’s expertise is a remodel he recently completed for a private residence north of Boston with four customized spaces in the basement. “This was definitely a whole home renovation, but the homeowner has a wine collection and contacted us about designing a wine cellar, multi-themed wine-tasting room and two additional rooms that went along with it,” he says. 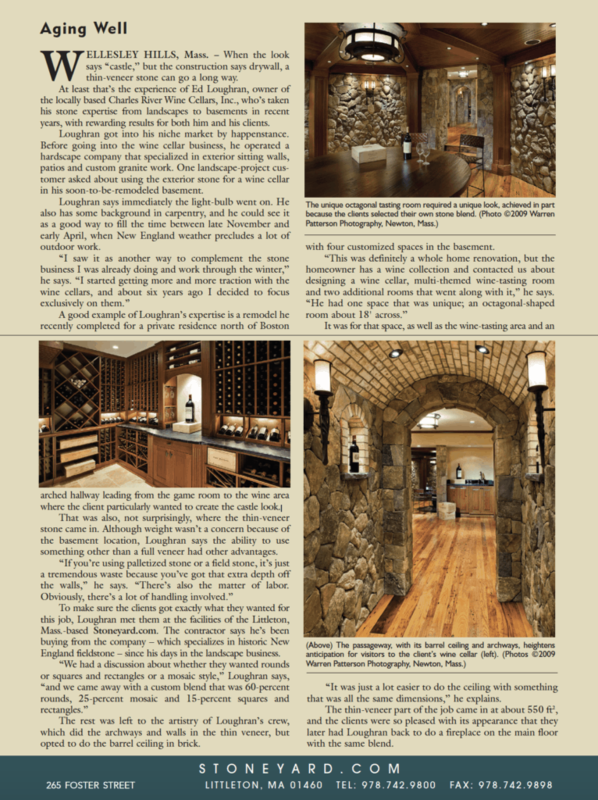 “He had one space that was unique; an octagonal-shaped room about 18′ across.” It was for that space, as well as the wine-tasting area and an hallway leading from the game room to the wine area where the client particularly wanted to create the castle look. That was also, not surprisingly, where the thin-veneer stone came in. Although weight wasn’t a concern because of the basement location, Loughran says the ability to use something other than a full veneer had other advantages. To make sure the clients got exactly what they wanted for this job, Loughran met them at the facilities of the Littleton, Mass.-based Stoneyard.com. The contractor says he’s been buying from the company – which specializes in historic New England fieldstone – since his days in the landscape business. The rest was left to the artistry of Loughran’s crew, which did the archways and walls in the thin veneer, but opted to do the barrel ceiling in brick. “It was just a lot easier to do the ceiling with something that was all the same dimensions,” he explains. The thin-veneer part of the job came in at about 550 ft2, and the clients were so pleased with its appearance that they later had Loughran back to do a fireplace on the main floor with the same blend.